There has been so much going on over the last few months that I’ve struggled to know where to start. Normally I find the inspiration for posts everywhere but it feels as if watching in silence (frequently the stunned kind) and listening (versus spouting off) has been the order of the day. Democracy has certainly shown us the power that the disenfranchised and unheard hold in their hands and the last six months has revealed the world to be a much more uncertain place than a whole lot of us thought it was. Uncertainty prevails closer to home too. Back in June I posted about the changes at work and this week it will be my turn to say my goodbyes. After almost six years, the people and projects that have shaped a large proportion of my life will disappear and while there will be some friendships that endure, I will be left with quite a large space in my life. The saying goes that nature abhors a vacuum and human nature is no exception. We are driven to achieve instead of discover, stillness must be filled with doing and silence is shattered with noise and words rather than peace and understanding. Space – finding it and holding on to it – is a tricky thing to manage. This photograph was taken yesterday as I stood on the second floor of the atrium in the Design Museum‘s new home, the old Commonwealth Institute building in Kensington. It’s a great example of the paradox of ‘holding the space’ – the challenges in maintaining the listed hyperbolic parabaloid roof versus the striking effect of the sweeping curves of the atrium ceiling. Is the former really worth the latter? My journey into this new space is not unexpected and for some time, I’ve had a general idea of what’s next and how I aim to build some different life choices into the next 8-10 years. Over the last year, I have been working on several things that may become pieces of this future but the really specific parts are not yet fully formed. It’s hugely exciting…and uncomfortable. Space – and uncertainty – is scary. When people ask me about what’s next, I feel the urge to explain it all, to define it and lay out the way forward. I jumped out of a plane about 15 years ago and it’s that same feeling – perched at the open door, looking out over the landscape sprawled below and questioning whether I was brave or stupid to be doing this. Then leaping out into the void, trusting that the agreed plan I’d learnt in my pre-jump training (as well as the parachute instructor strapped onto my back) would result in my landing on my feet again. And I felt it when I arrived at Heathrow Airport almost 13 years ago, with nothing before me except the chance to build a new life. In both cases there was much ungainly sprawling and innumerable dents to my ego. But what an education I’ve had. I’ve created opportunities to be generous and inspire others, something that really speaks to my heart. And I’ve developed a knack for making the space to explore, to reflect, to trust that what I want is okay and to find the quiet moments (mainly during my regular swim sessions) when the voices in my head get opinionated and shout-y. It’s been busy on the extra-curricular front lately and I’ve experienced such an extraordinary trio of events that it’s actually taken me a while to shape all of the amazing stuff I’ve seen and heard into something more than a rambling discourse. I love Flamenco. I’ve loved it ever since the moment I first set eyes on it in Seville in 2002. I love it deeply and passionately, like the spirit of the dance itself. And a little over two weeks ago I was in the audience for Flamenco Gala, the event that marked the opening of the London Flamenco Festival. It was an hour and 45 minutes of pure transformation. Each piece was filled with its own essential character: intense sensuality, sartorial elegance, youthful impertinence. (And that was just the three ‘leading’ men.) There were no stage sets and no props, each performance needing only the cast of dancers, musicians and singers to capture its essence and cast it out into the audience. I reached out to grab it and never wanted them to stop. These people transformed Sadlers Wells with their passion and fierce charm, drawing us in and holding us in their thrall until the very last compás. As the last note faded, the theatre filled with woops and bravos and cheering and my arms ached from clapping for so hard and so long. It was utterly thrilling (and may have had something to do with my insomnia that night). The following week I went hear Thomas Heatherwick speak on surprise, ingenuity and transformation. This is the man who has hit the headlines here in London with his new London bus design and who alongside Joanna Lumley, has been inspired to transform Londoners’ relationship with the Thames through the Garden Bridge proposal. He is also the man who, during London’s 2012 Olympic Games, transformed the Opening Ceremony: an extraordinary moment in Olympic history that showed how the true spirit of the Games – a coming together of 204 nations in a single endeavour – could be epitomised in the lighting of the flame. He has been doing many other things and for just over 2 hours, talked passionately about transforming our urban environments through a unique blend of redefining the brief and solving ‘the problem’. I didn’t love every project he showed us but I had a strong opinion on each and for me, that’s what sets this catalogue of innovative design ahead of the rest. And then last Sunday I went to see an interview with novelist and academic Howard Jacobson. I’ve never read any of his books but I had read articles he’d been quoted in and was curious to hear what he had to say. His new book J, imagines a dystopian future where many ‘Js’ are banned – no jokes, no jazz and no Jews. The discussion became less about the story itself (excellent, no spoilers!) and more about ideologies and the human need for argument to keep such ideologies alive. Being Jewish himself (the interview was part of Jewish Book Week), he particularly talked about the notion of Christian/Jewish argument being at the source of each of these ideologies and that without one, perhaps the other would not exist. He posed the question that if the opposing view just disappeared and there was no need to defend a position, would an ideology simply run out of steam? I thought about that all the way home. The theme that has so enchanted me about these three events has been their ability to transform, whether in bringing a passionate past to life, a striking twist to an urban landscape or a thought-provoking version of a possible future. I love that these experiences stimulate my imagination and for days afterwards, I felt inspired creative and somehow emboldened in my day to day endeavours. And it seems to me that these people and others like them – who keep exploring the what ifs about our world – are the ones who, with every step, design or idea will inspire us to break out of our comfortable cocoons and strive for new horizons. Yesterday I went to see the movie Selma. It’s about Martin Luther King and the Civil Rights Movement’s defining march from Selma, Alabama to the state’s capital, Montgomery in 1965. It was hard to watch in places – the barbarity of humankind is a confronting thing to see – but at the same time, I also learned a thing or two and was particularly inspired by LBJ‘s involvement in getting the Civil Rights Act of 1968 through Congress. I had no idea that he actually did this thing that made such an enormous difference in his time as President of the United States (1963 to 1969). Earlier this year, my boss confirmed that I had been selected to participate in our Leadership Development Programme and this week, I received a couple of books to read on Go MAD thinking (MAD stands for Making A Difference) as part of the preparation. Having arrived home from the cinema feeling somewhat sober and reflective, reading something called Go MAD: the art of making a difference really hit the right note. that you are willing to give up being a caterpillar. There’s something about ‘flying’ that provokes feelings of being free for me. I jumped out of a perfectly good plane once – albeit attached to the front of someone more expert at it than myself – and during the exhilaration of the free fall, experienced an overwhelming sense of freedom and peace that I never wanted to end. You could argue that I did this – flew that is – at least once more when I left my comfortable life in Australia and built this one here in London that I love so much. Strange accent aside, some might not see so many changes but deep down I know myself very differently from the 34-year-old who left Melbourne in 2004. So how does one become a butterfly? The butterfly doesn’t know exactly how the world outside its chrysalis will be. It just knows it needs to spread its wings to survive and thrive in whatever lies ahead. Over the last 6 months, I have also had a sense of a change coming. I haven’t known quite what this might be – a bit like the butterfly – but my gut is telling me to be ready. And by ready I really mean being open – to new ideas, ambitions and possibilities. 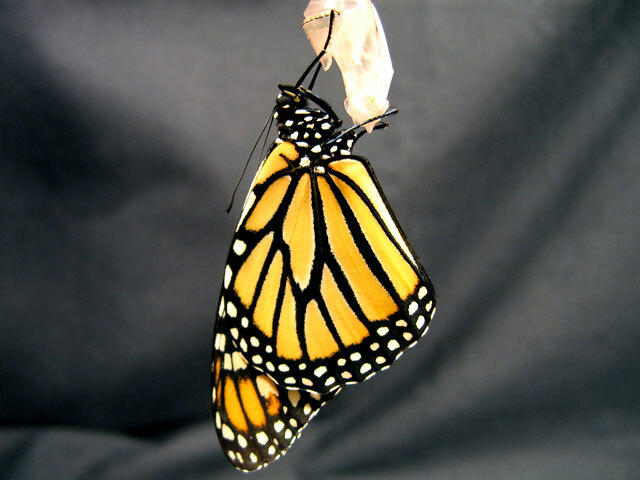 I’m calling this the Butterfly Principle – this preparing to take flight despite an unknown, uncertain future. 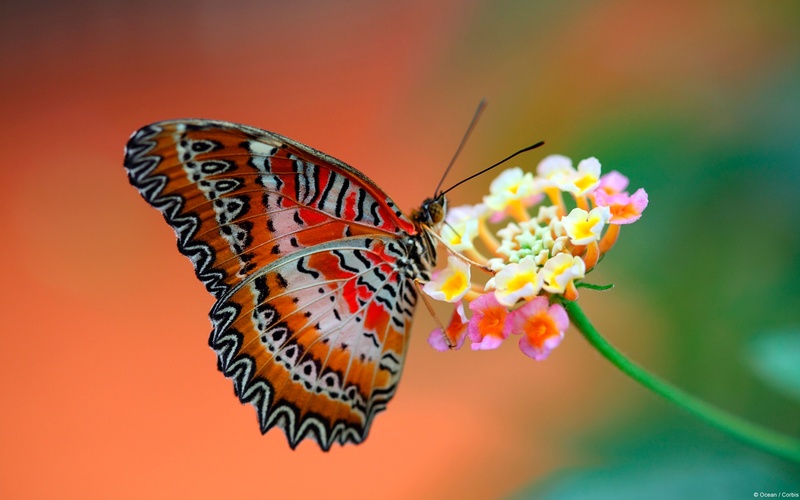 It is fluttering gently around my thoughts and making me wonder what path I will carve out next. Will it be a continuation of the current one with a change just around the corner? Or will there be a fork in the road? So I’m off to explore how I want to spread my wings and take flight. Who knows what’s going to be next? All I know is that I’m looking forward to finding out. And I’d love to hear what inspires you to fly.